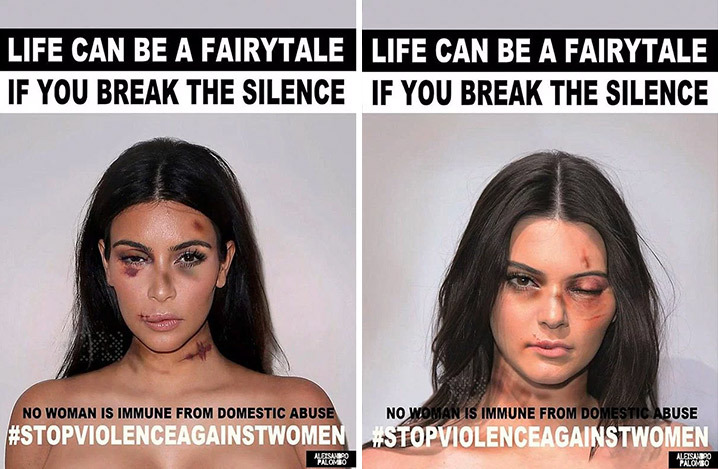 Someone pulled a Robin Hood on Kim Kardashian and Kendall Jenner by jacking their extremely valuable images to use them for a worthy cause -- the #StopViolenceAgainstWomen campaign. The photos are shocking ... depicting Kim and her sis with horrific cuts and bruises with the caption, "No woman is immune from domestic abuse." It's a powerful image and message, but we're told neither Kim nor Kendall signed off to join the fight. Our Kardashian sources tell us that no one ever contacted the women to get permission to use their faces, and now their attorneys are reaching out to the artist responsible to issue a warning. The obviously photoshopped images are actually paparazzi shots from last year's Valentino fashion show in Paris. Several other celebs -- Angelina Jolie, Miley Cyrus and Madonna -- got the same treatment. We're told Kim and Kendall happen to back the cause, but also think it's important that people have the right to choose to be involved.